Some prepared dishes are not suitable for later use as a leftover…they lose their taste and texture, so it is best to just part with them right there and then. Numerous others, on the other hand, are still great for at least one or two meals, or even to be frozen for that rainy day when you have no time or desire to cook. Some people do not like leftovers, and never keep them. However, if you are like me, you don’t mind them, and feel that you get your money’s worth if you use them. Most Europeans don’t believe in leftovers….maybe because they hardly ever have any. They serve their meals already preportioned per plate, and make just enough to feed the crowd they accounted for. The portions are large enough to satisfy the consumer, so there is no need, or room, for seconds. Therefore, there are no leftovers. Any remaining food on each plate, which hardly ever happens, is discarded. It is almost impolite to ask for a “Doggie Bag”. Here in the USA we have no problem asking the waiter/waitress to pack up our leftovers to take home with us. It is very important to keep track of your leftover food in your fridge, which is one of my pet peeves. I almost feel like I am a fridge police, whether it is at home or at work. There is nothing worse than seeing “old” food sitting in the fridge way past its safe consumable time. My personal time line for using up leftovers in up to 3 days…4 being the absolute max. Now I will share my best way of using up leftovers, and keeping your fridge fresh, and ready for restocking. Since most of us work full-time, and don’t have much time for cooking during the week, we prepare extra food on weekend, to hold us over for couple of days. Then by mid-week, it’s time for some take out. By Thursday we have leftovers to use, or lose. I consider Thursday a “Leftover Smorgasbord Dinner Day”. We pull out all the leftovers from the past few days, and add something new if needed, and call it a day. 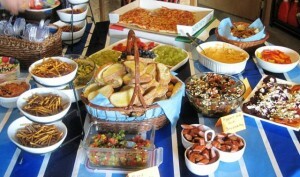 Everyone is to create their own plate of food from the smorgasbord spread available. We also use disposable dishes and utensils that day, to save time on clean up effort. Whatever food is remaining after this dinner, gets discarded for good. This is the BEST way to free your fridge of leftover food, and to prevent any food from hiding in there for too long. Since we have no dishes to wash on this day, we devote our time to cleaning up the fridge, and getting it ready for fresh food from Friday or Saturday shopping. It works very well every time, and it also is fun, economical, and stress free. I suggest you try it too, and share your comments.